Want to be featured in the media? With content creation at an all time high, there has never been a greater time to make a statement and cut through the noise. The FITtopia Media Hub is designed to change the health, fitness and lifestyle content landscape. No longer will it be cluttered, but curated. 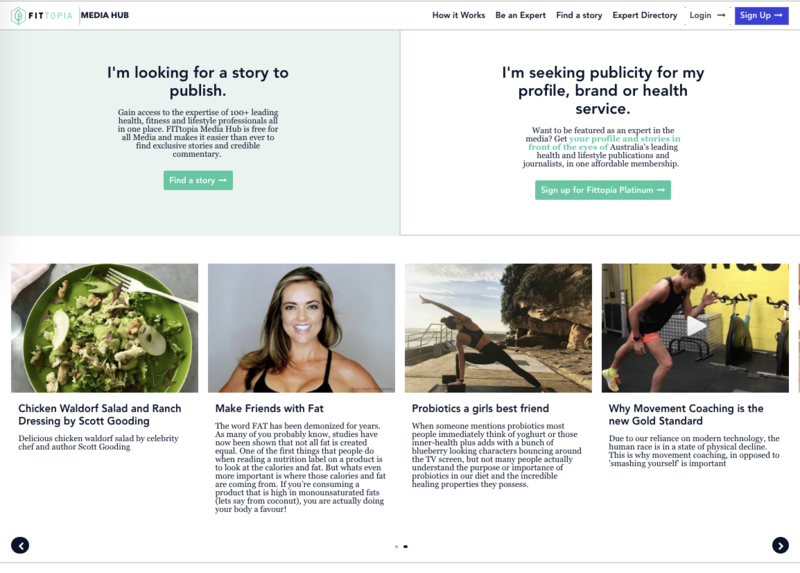 A private ‘member’s only’ site, FITtopia Media Hub allows experts to post their story ideas – from tips, new research and recipes to workouts and trends – all for the media to access with the intention of publishing to build your brand credibility. Journalists can also send out ‘call outs’ when they are looking for experts to comment on their existing articles. With the likes of Sydney Morning Herald, Women’s Health, Body and Soul and Marie Claire on board, you will certainly be showcased in front of very good company! We charge a membership fee of $25 per week to be on the site, just a fraction of what it would cost to run a dedicated PR and marketing campaign. Because the players are the same, but the game has changed! Receive an in-depth guidebook outlining how come up with the best story ideas for your brand and how to stand out on the platform.